Legions of volunteer, amateur astronomers are turning their eyes to the sky thanks to online image portals and doing extraordinary science. ASTRONOMERS ARE INCREASINGLY enlisting volunteer “citizen scientists” to help them examine a seemingly endless stream of images and measurements of the universe. These volunteers’ combined efforts are having a powerful impact on the study of the cosmos. Just last November, a citizen science project called Space Warps announced the discovery of 29 new gravitational lenses, regions in the universe where massive objects bend the paths of photons (from galaxies and other light sources) as they travel toward Earth. As cosmic phenomena go, the lenses are highly prized by scientists because they offer tantalizing glimpses of objects too distant, and dim, to be seen through existing telescopes, as well as key information on the lensing objects themselves. The Space Warps’ haul of lenses is all the more impressive because of how it was obtained. During an eight-month period, about 37,000 volunteers combed through more than 430,000 digital images in a huge, online photo library of deep space. Automated computer programs have identified most of the 500 gravitational lenses on astronomer’s books. However, computers failed to flag the 29 lenses the Space Warps volunteers spotted, speaking to unique skills we humans possess. The Kavli Foundation spoke with three researchers, all co-authors of two papers published in the Monthly Notices of the Royal Astronomical Society describing the Space Warps findings. In our roundtable, the researchers discussed the findings and the critical role citizen science is playing in furthering astronomical discovery. Anupreeta More – is a project researcher at the Kavli Institute for the Physics and Mathematics of the Universe (Kavli IPMU) at the University of Tokyo. More is a co-principal investigator for Space Warps, a citizen project dedicated to identifying gravitational lenses. Aprajita Verma – is a senior researcher in the department of physics at the University of Oxford. Verma is also a co-principal investigator for Space Warps. Chris Lintott – is a professor of astrophysics and the citizen science lead at the University of Oxford. Lintott is a co-founder of Galaxy Zoo, a citizen science project in which volunteers classify types of galaxies, and the principal investigator for the Zooniverse citizen science web portal. The Kavli Foundation: Anupreeta and Aprajita, where did you get the idea — along with your co-principal investigator Phil Marshall of the Kavli Institute for Particle Astrophysics and Cosmology (KIPAC) at Stanford University — to put volunteers to work on identifying gravitational lenses starting back in 2013? ANUPREETA MORE: A few years ago, Chris Lintott gave a talk on citizen science at the Kavli Institute for Cosmological Physics in Chicago, where I was working at the time. It got me thinking about a lens search by citizen scientists. APRAJITA VERMA: For Phil Marshall and I, Space Warps grew out of Galaxy Zoo. Soon after Galaxy Zoo launched, I started to look at some of the galaxies that were being posted on the Galaxy Zoo user forum that had potential lensed features surrounding them. This was a great by product of the core Galaxy Zoo project. However, we realized that to find these incredibly rare sources, which are often confused with other objects, we really needed a tailored interface to efficiently find lenses. This grew into Space Warps. TKF: Chris, Galaxy Zoo itself was inspired by Stardust@home [a project running on BOINC software from UC Berkeley], the first astronomy-based citizen science project in which people played an active role. Until then, citizen scientists were often computer owners who offered up free processing power on their devices to aid in machine-driven data analysis. Were you concerned when you started Galaxy Zoo in 2007 that it would be hard to attract volunteers? But that turned out to be almost beside the point. As we’ve done many of these citizen science projects over the years, we’ve discovered it’s not the quality of the images that matter. After all, our galaxies aren’t typically beautiful. They are not the Hubble Space Telescope shots that you’d expect to find on the front page of the New York Times. Our galaxies are often fuzzy, little, enigmatic blobs. The Space Warps images are pretty, but again they’re not the kind of thing you would sell as a poster in the gift shop at the Kennedy Space Center. It’s actually the ideas that get people excited. I think Space Warps and Galaxy Zoo have been successful because they have done a great job of explaining to people why we need their help. We’re saying to them: “Look, if you do this simple task, it allows us to do science.” This idea is best shown by Planet Hunters, a citizen science project that searches for exoplanets in data from NASA’s Kepler spacecraft. Users are looking at graphs for fun. But because the idea is the discovery of exoplanets, people will put up with looking at data. TKF: What sort of unique science is made possible because of Space Warps? VERMA: Gravitational lenses allow us to look at objects, such as very distant galaxies, that are fainter and in much more detail than with the telescopes we have now. It’s enabling the kind of science we’ll be routinely doing with extremely large telescopes in the future. MORE: That’s right. Something unique about gravitational lensing is that it acts like a natural telescope and allows us to study some really faint, distant galaxies which we wouldn’t get to study otherwise. We’re seeing these distant galaxies in the early stages of their life cycle, which helps us understand how galaxies evolve over time. Also, in a gravitational lens system, it’s possible for us to study the properties of the foreground galaxies or galaxy groups that are gravitationally lensing the background sources. For example, we can measure the mass of these foreground galaxies and also study how mass is distributed in them. TKF: Space Warps and other citizen science projects flourish because computer programs sometimes struggle at identifying features in data. Why do computers have trouble spotting the characteristic arc or blobby shapes of gravitational lenses that humans can? MORE: The problem is that these arc-like images of distant galaxies can have very different shapes and profiles. 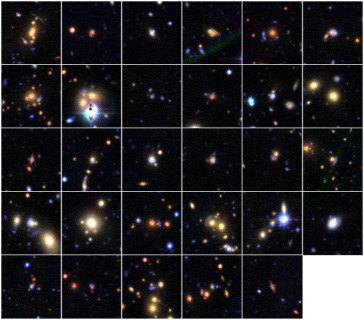 The process of lensing magnifies these galaxies’ images and can distort them. Also, these distant galaxies emit light at different wavelengths and can appear to have different colors. Furthermore, there are structures in these galaxies that can change the shape of the arcs. VERMA: Also, lots of spiral galaxies have bluish spiral arms that can look like lenses. We call these objects “lens impostors” and we find many more of these false positives compared to rare, true gravitational lenses. MORE: All these differences make it difficult to automate the process for finding lenses. But human beings are very good at pattern recognition. The dynamic range that our eyes and our brains offer is much greater than a computer algorithm. LINTOTT: Another thing to bear in mind in astronomy, particularly in Space Warps, is that we’re often looking for rare objects. A computer’s performance depends very strongly on how many examples you have to “train” it with. When you’re dealing with rare things, that’s often very difficult to do. We can’t assemble large collections of hundreds of thousands of examples of gravitational lenses because we don’t have them yet. Also, people — unlike computers — check beyond what we are telling them to look for when they review images. One of the great Space Warps examples is the discovery of a “red ring” gravitational lens. All the example lenses on the Space Warps site are blue in color. But because we have human classifiers, they had no trouble noticing this red thing that looks a little like these blue things they’ve been taught to keep an eye out for. Humans have an ability to make intuitive leaps like that, and that’s very important. KF: Aprajita and Anupreeta, what’s the importance of the red ring object Chris just mentioned that the Space Warps community discovered in 2014 and has nicknamed 9io9? VERMA: This object was a really exciting find, and it’s a classic example of something we hadn’t seen before that citizen scientists quickly found. We think that inside the background galaxy there’s both an active black hole, which is producing radio wave emissions, as well as regions of star-formation. They’re both stretched by the lensing into these spectacular arcs. It’s just a really nice example of what lensing can do. We’re still putting in further observations to try and really understand what this object is like. MORE: In this particular case with 9io9, there is the usual, main lensing galaxy, but then there is also another, small, satellite galaxy, whose mass and gravity are also contributing to the lensing. The satellite galaxy produces visible effects on the lensed images and we can use this to study its mass distribution. There are no other methods besides gravitational lensing which can provide as accurate a mass estimate for galaxies at such great distances. TKF: Besides 9io9, citizen astrophysicists have turned up other bizarre, previously unknown phenomena. One example is Hanny’s Voorwerp, a galaxy-size gas cloud discovered in 2007 in Galaxy Zoo. More recently, in 2015, Planet Hunters spotted huge decreases in the starlight coming from a star called KIC 8462. The cause could be an eclipsing swarm of comets; another, albeit unlikely, possibility that has set off rampant speculation on the Internet is that an alien megastructure is blocking light from the star. Why does citizen science seemingly work so well at making completely unexpected discoveries? LINTOTT: I often talk about the human ability to be distracted as a good thing. If we’re doing a routine task and something unusual comes along, we stop to pay attention to it. That’s rather hard to develop with automated computer systems. They can look for anomalies, but in astronomy, most anomalies are boring, such as satellites crossing in front of the telescope, or the telescope’s camera malfunctions. However, humans are really good at spotting interesting anomalies like Hanny’s Voorwerp, which looks like either an amorphous green blob or an evil Kermit the Frog, depending on how you squint at it. [Laughter] The point is, it’s something you want to pay attention to. The other great thing about citizen science is that the volunteers who find these unusual things start to investigate and become advocates for them. Citizen scientists will jump up and down and tell us professional scientists we should pay attention to something. The great Zooniverse discoveries have always been from that combination of somebody who’s distracted and then asks questions about what he or she has found. TKF: Aprajita and Chris, you are both working on the Large Synoptic Survey Telescope (LSST). It will conduct the largest-ever scan of the sky starting in 2022 and should turn up tons of new gravitational lenses. Do you envision a Space Warps-style citizen science project for LSST? VERMA: Citizens will play a huge role in the LSST, which is a game-changer for lensing. We know of about 500 lenses currently. LSST will find on the order of tens to hundreds of thousands of lenses. We will potentially require the skill that citizen scientists have in looking for exotic and challenging objects. Also, LSST’s dataset will have a time dimension. We’re really going to make a movie of the universe, and this will turn up a number of surprises. I can see citizen scientists being instrumental in a lot of the discoveries LSST will make. LINTOTT: One thing that’s challenging about LSST is the sheer size of the dataset. If you were a citizen scientist, say, who had subscribed to receive text message alerts for when objects change in the sky as LSST makes its movie of the universe, then you would end up with a couple of billion text messages a night. Obviously that would not work. So that means we need to filter the data. We’ll dynamically decide whether to assign a task to a machine or to a citizen scientist, or indeed to a professional scientist. TKF: Chris, that comment reminds me of something you said to TIME magazine in 2008: “In many parts of science, we’re not constrained by what data we can get, we’re constrained by what we can do with the data we have. Citizen science is a very powerful way of solving that problem.” In this era of big data, how important do you all see citizen science being moving forward, given that computers will surely get better at visual recognition tasks? LINTOTT: In astronomy, if you’re looking at things that are routine, like a spiral galaxy or a common type of supernova, I think the machines will take over. They will do so having been trained on the large datasets that citizen scientists will provide. But I think there will be citizen involvement for a long while and it will become more interesting as we use machines to do more of the routine work and filter the data. The tasks for citizen scientists will involve more varied things — more of the unusual, Hanny’s Voorwerp-type of discoveries. Plus, a lot of unusual discoveries will need to be followed up, and I’d like to see citizen scientists get further into the process of analysis. Without them, I think we’re going to end up with a pile of interesting objects which professional scientists just don’t have time to deal with. VERMA: We have already seen a huge commitment from citizen scientists, particularly those who’ve spent a long time on Galaxy Zoo and Space Warps. For example, on Space Warps, we have a group of people who are interested in doing gravitational lens modeling, which has long been the domain of the professional astronomer. So we know that there’s an appetite there to do further analysis with the objects they’ve found. I think in the future, the citizen science community will work hand-in-hand with professional astronomers. TKF: Are there new citizen astrophysicist opportunities on the horizon related to your projects? LINTOTT: Galaxy Zoo has a new lease on life, actually. We just added in new galaxies from a telescope in Chile. These galaxies are relatively close and their images are beautiful. It’s our first proper look at the southern sky, so we have an all-new part of the universe to explore. It gives users a chance to be the first to see galaxies — if they get over to Galaxy Zoo quickly! VERMA: For Space Warps, we are expecting new data and new projects to be online next year. MORE: Here in Japan, we are leading an imaging survey called the Hyper Suprime-Cam (HSC) survey and it’s going to be much larger and deeper than what we have been looking at so far. We expect to find more than an order of magnitude increase in the number of lenses. Currently, we are preparing images of the candidates from the HSC survey and hope to start a new lens search with Space Warps soon. TKF: Is it the thrill of discovery that entices most citizen scientist volunteers? Some of the images in Galaxy Zoo have never been seen before because they were taken by a robotic telescope and stored away. Volunteers therefore have the chance to see something no one else ever has. MORE: That discovery aspect is personal. I think it’s always exciting for anyone. In the years since, we’ve also come to realize that citizen science is a collective endeavor. The people who’ve been through 10,000 images without finding anything have contributed to the discovery of something like the red ring galaxy just as much as the person who happens to stumble across it. You need to get rid of the empty data as well. I’ve been surprised by how much our volunteers believe that. It’s a far cry from the traditional, public view of scientific discovery in which the lone genius makes the discovery and gets all the credit. VERMA: We set out with Space Warps for citizen scientists to be part of our collaboration and they’ve really enabled us to produce important findings. They’ve inspired us with their dedication and productivity. We’ve learned from our analysis that basically anyone who joins Space Warps has an impact on the results. We are also especially grateful for a very dedicated, diligent group that has made most of the lens classifications. We look forward to welcoming everyone back in our future projects!